My husband, who absolutely loves the rice from the take out places, was at work so I just had myself and my son as judges. He'll pretty much eat any rice so it came down to what I thought of the finished product. I raided the fridge to see what kind of veggies I had and got to work. When all was said and done, I tasted the rice and fell in love with it. It was fresh tasting and had a lightness that the restaurant versions don't even come close to having. I might try it with some chicken or pork at some point, but until then, this is definitely what I'm making with my next Chinese meal. 1. In non-stick skillet or wok, cook white parts of onion in 1 TB oil until almost soft. 2. Add garlic and cook for about another 30 seconds. Be careful not to burn it. 3. Add frozen veggies and water chestnuts to the pan and cook until thawed but still crisp. Stir frequently. 4. Remove veggie mix from the pan and set aside. 5. Melt butter in pan and scramble eggs until almost done but still moist. 6. Remove eggs from the pan and add to veggies. Break up eggs into small pieces. 7. Add remaining 1 TB oil into pan. When heated, add rice. 8. 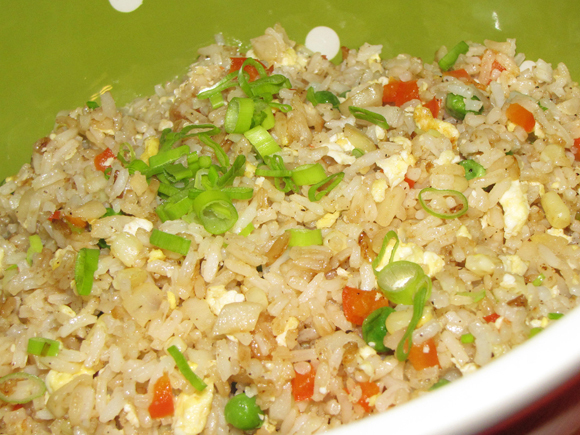 Stir-fry rice until hot, breaking up large pieces as you go. 9. Add soy sauce and oyster sauce to rice, stirring well for a few minutes. 10. Add veggies, egg, and remaining green onion to pan and mix well.